Cannabis indica is perfectly suited to long hot summers and dry conditions. Southern cannabis cultivators are perfectly positioned to crop bumper outdoor marijuana harvests. All you need are the right seeds. We've put this list of the top 5 indica strains together to help you take maximum advantage. We all know that cannabis is a hardy industrious plant species that can be cultivated all over the globe. However, if you happen to be farming your cannabis outdoors, someplace down south is usually the best spot to crop. Southern European growers have the luxury of long hot summers with plenty of sunshine. While most northern Europeans exclusively grow cannabis indoors. In contrast, around the Mediterranean, the opposite holds true for the majority of personal cultivators. Whether it’s a short and discreet balcony grow or bigger plantation you need the very best genetics to harvest a fat stash of dank buds. Indica leaning strains are a great option for both those that enjoy couchlocking cannabis effects and the resourceful grower. Indica photoperiod cannabis typically flowers in 8-10 weeks. Autoflowering indica hybrids can be ready for harvest in the same time frame. That translates to multiple bumper harvests per year for southern growers. Elite photoperiod indica strains penetrate the 20% THC level ceiling. While next-gen autoflowering indica hybrids are not far behind with 15%+ THC levels and a phenomenally fast life-cycle to boot. Our top 5 indica strains blog comprises the very finest of both. Probably the best 5 ways to set your southern cannabis garden on Fire! In a good way. Royal Cookies is the product of the Breeders at Royal Queen Seed’s quest to develop the definitive cookie monster cannabis strain. By selectively breeding the finest Californian cookies cultivars and refining the progeny, the recipe has been perfected. Southern growers that sow Royal Cookies seeds in summer will be in store for the most decadent cannabis treat by October. The complex blend of sweet cookies and rich earthy undertones will excite your nostrils and positively delight your palate. But make no mistake; these sugary cookie nuggets pack a serious punch. Expect 23% THC. Plants will branch vigorously and bush out well in a sunny southern climate. Compact ganja bushes approx 1.5m tall capable of producing up to 500g can be achieved. You won’t find the cookie stash jar empty anytime soon after you give these beans a run. Royal Domina is a hybrid of genuine heavy indica royalty. By crossing the legendary Black Domina with the rare dankness of Kalijah an indica queen was born. Few strains can boast such a pedigree lineage as the Royal Domina. For the beginner grower, Royal Domina is a wonderful introduction to high-grade indica cannabis. Royal Domina cultivated outdoors in a large container, placed in good sunshine, can develop into a magnificent bud-laden cannabis bush by September. Enormous yields of up to 600g per 1.4m-1.8m plant are possible. Royal Domina flowers the richest hash-like, old school, super potent, indica nuggets in just 7-8 weeks of bloom. She is hardy, copes well with high temps, and requires only minimal fertilisation. As you would expect, the weed is knockout strong with 20%+ THC levels. The only question is, does your cannabis garden need a new queen? Royal Gorilla is the very tip of the spear of potent cannabis. For those southern growers that want a truly exceptional cannabis variety in the cannabis garden, accept no substitutes. Royal Gorilla will glue you to the couch with just a few tokes from a spliff and you will love every minute of it. Diesel-like growth characteristics are to be expected. This King Kong indica-dominant hybrid will benefit from early training and or pruning. With some maintenance, 2m tall highly productive ganja trees can be cropped in warm sunny conditions. Take care not to plant too late in summer. Especially in coastal regions, as high humidity is a real threat to these dense, gooey connoisseur buds. Royal Gorilla can handle high doses of nutes and thrives in dry climates. The reward for a little TLC is stratospherically high potency 25%+ THC marijuana. This sticky weed is as infamous as it is acclaimed for its heavy couchlock effect. For a heavy indica hybrid bursting with flavour and endowed with autoflowering genetics look no further than the Royal Creamatic. By successfully hybridising the southern Spanish outdoor growers favourite Cream Caramel with Ruderalis the tastiest indica nuggets can now be harvested in just 8 weeks post germination. Royal Creamatic is squat, usually staying under 1m. She is low maintenance and ideally suited to the balcony grower. Effects and flavour are very similar to classic Cream Caramel. Sweet, sedating smoke. Perfect for the end of a long day. More experienced outdoor growers can possibly squeeze in two tasty harvests in a good summer. With 15%+ THC, 100g+ per plant yields and nothing more than basic growing requirements the Royal Creamatic is a genuine high performance auto. 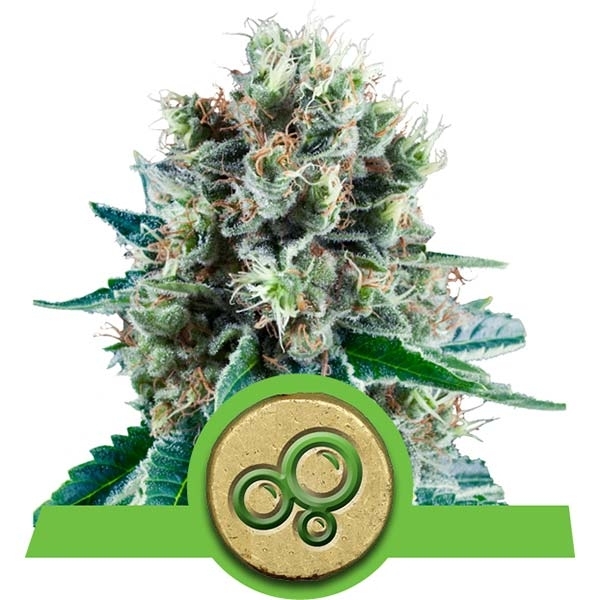 Perhaps the most adventurous indica-dominant hybrid in the Royal Queen Seeds autoflowering collection is the Bubble Kush Automatic. Uniting a holy trinity of cannabis strains was no easy task. OG Kush, Bubblegum and Critical Automatic fused into one strain is beyond the capability of most seedbanks. 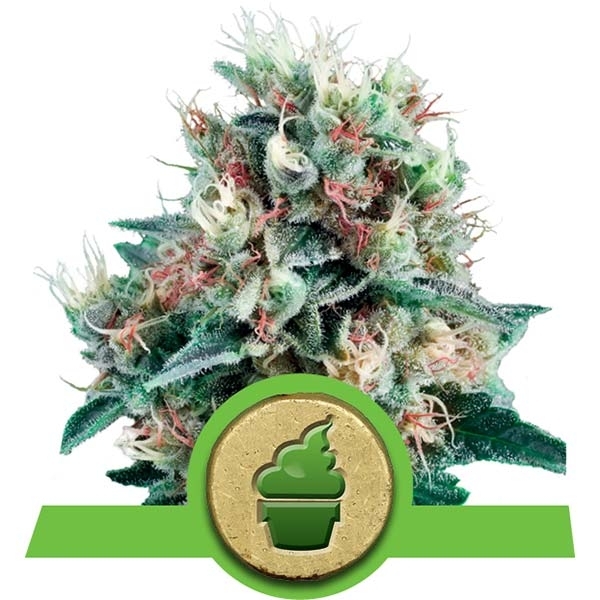 Years of careful selection and incredibly high RQS breeding standards have delivered the exemplary all new autoflowering hybrid that is Bubble Kush Automatic. For an auto, Bubble Kush Automatic is quite large. Reaching heights of 1.2-1.4m outdoors allows the strain to produce far more flowers than most autos. Yields can exceed 150g per plant. Bubble Kush Automatic will only take 7-8 weeks following germination to make it to harvest. To smoke Bubble Kush Automatic is a treat for all indica lovers. 16% THC ensures a pleasant long lasting body stoned with a slight cerebral euphoric kick to keep you giggling. Ideally suited to beginner growers and seasoned growers looking to crop a couple of fat harvests in one fine southern summer.